1) iPad 3G model has a built-in GPS so it can be used as a chart plotter without any external GPS input. GPS seems to be very accurate since we have not noticed any discrepancy with our Garmin GPS. 2) Navionics Marine HD charts are very inexpensive for iPad, compared to cost of the charts for normal chart plotter. The charts are comparable to Navionics Gold charts, which are used in plotters. 3) iPad uses less power than a normal laptop and has a battery capacity of about 10 hours. What I most like about iPad is that it can be switched on from the standby mode within a few seconds. However finding the GPS signal can take some time. Often one needs the plotter to check some details so it is switched on only for about a minute or so at a time. 4) Using the touchpad for zooming and moving through the chart is very handy. iPad is portable, so it can be used anywhere. 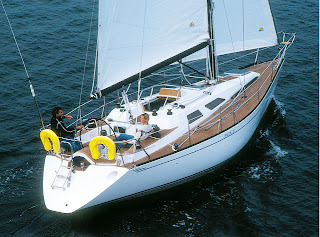 For example, during the off-watch skipper can use it to check the position, speed and course of the vessel. 1) First of all it is not water- or shockfproof so one must be cautious when using it in a moving boat. It would be good idea to have some kind of stand or special case where iPad could be mounted when not in use. We have it in its normal storage case in the cockpit in good weather. In bad weather it can only be used indoors. 2) iPad has a glossy screen and thus it can be difficult to see the chart in bright sunlight. 3) The Navionics software crashes occasionally. It happens usually when scrolling through the map too fast. However, iPad usually recovers quickly and the software can be restarted immediatelly. 4) The Navionics mobile interface is stripped down. For example routes cannot be saved and there are no waypoint or MOB-functions. 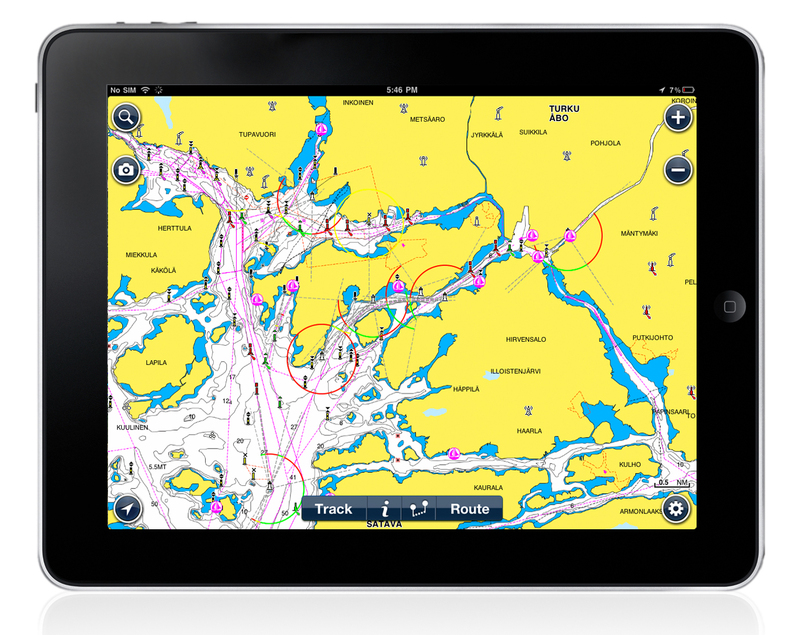 We have Navionics Europe HD -application which costs around 50 € for iPad. However, sea areas of Denmark and UK are excluded from this application, so they need to be purchased separately. Maps are downloaded to the iPad's memory so there is no need for internet connection when using the application. By the way, we have written a blog post on waterproof tablets as well! This exactly mirrors my experience with the same system last year. We also used Navionics on an iPhone which had the advantage of living in my pocket! The only downside (with the iPhone) is that the screen is so small; but the zoom function is so good it didn't really matter much. I think it is a brilliant system! Best wishes, Richard (England, East coast). We also thought about buying the application for iPhone since I (Minna) have one but still we have been using it only by iPad because of the size of the screen. But I believe that with iPhone it could be very handy! Yes Minna, it can be very handy having a personal GPS/plotter in one's oilskin pocket, especially when short-handed night sailing! The forecast doesn't look too pretty for you in the next day or so :-( Things should improve once you turn East! The Navionics group of app + regional chart look nice, straight forward interface, good value. Here is another take on the "chart plotter on your iPad" idea... You can get iNavX (see www.inavx.net ) through the iTunes App Store. It can immediately download free NOAA charts if you need USA waters. Additionally, iNavX can download any group of separately purchased charts from the X-Traverse.com service -- including a variety of Navionics Gold, HotMaps Premium, and Fish 'N Chip charts. The iNavX app has powerful features for boaters needing live GPS positioning. And iNavX will call up multiple raster and vector chart regions in the same app (i.e. no need switch to another app's region). Minor note: the charts from X-Traverse inside of iNavX live in a completely separate "sandbox" compared to the Navionics apps + charts, so there is no mixing charts between app brands. By the way, I work for Fugawi / X-Traverse (have posted as "anonymous" for convenience). I hope my little aside of information will be helpful for those looking at the range of options. 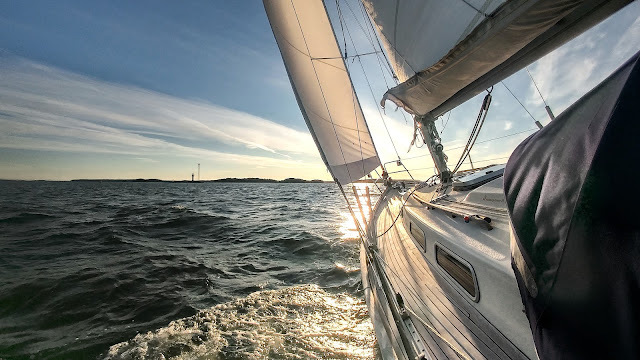 You should have mentionned that the charts "purchased" through Fagawi/X-traverse scheme are on a lease basis because to use the Navionics charts, to transfer way points everything has to go through X-traverse web base application. It is not true that you purchase charts you have the usage as long as you pay the annual fee to X-traverse. I cannot backup the charts, I cannot transfer my waypoints from one unit to another without having an internet connection, not very convenient when at sea . . . Like for everything Apple freedom of choice is pretty limited.